(AP) JOPLIN, Mo. - A mosque in southwest Missouri burned to the ground early Monday in the second fire to hit the Islamic center in little more than a month, officials said. The fire at the Islamic Society of Joplin was reported about 3:30 a.m. Monday, the Jasper County Sheriff's Office said. The sheriff's department said the building was a total loss. No injuries were reported and no charges have been filed. Imam Lahmuddin, who leads the mosque and was in the building until late Sunday, said he was "sad and shocked" about the fire. "I'm still in front of the building looking at the damage and nothing can be saved," Lahmuddin said in a telephone interview Monday. "But since we are people of faith we just can remember that this is a thing that happened because God let it happen, and we have to be patient, particularly in the month of Ramadan, control our emotions, our anger." Authorities sifted through the black debris Monday. Only remnants indicated a building had been there, including some stone pillars that were still standing and a few pieces of charred plywood loosely held up by a frame. At least a dozen law enforcement vehicles and a fire truck were at the scene. 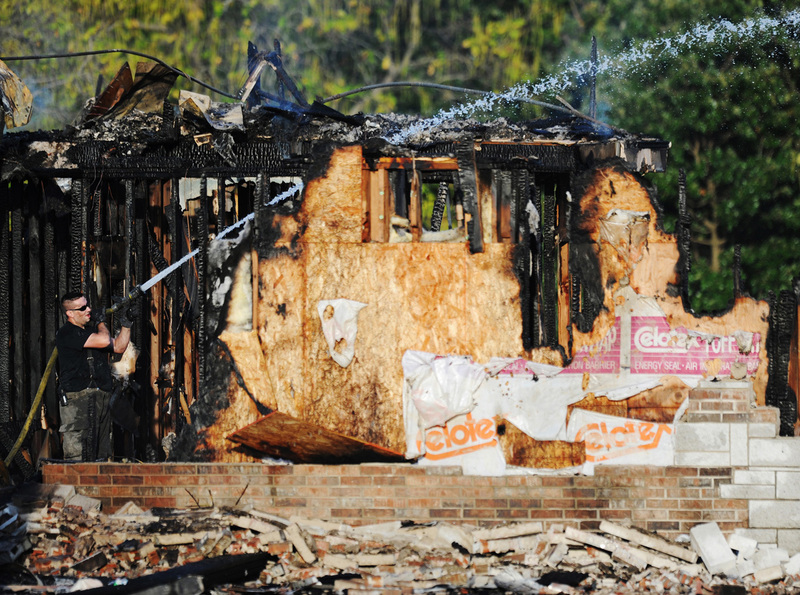 A blaze at the same building July 4 caused minor damage and was determined arson. No arrests were made and the FBI has offered a $15,000 reward for information leading to charges in that fire. The agency released video footage of what appeared to be a man starting the July blaze that did not cause extensive damage. Sharon Rhine, spokeswoman for the sheriff's office, said the center's security cameras were burned in the Monday fire. The FBI is investigating the cause of the latest fire and whether or not it was also the result of arson, said agency spokeswoman Bridgett Patton. A Washington-based Muslim civil rights organization meanwhile called for more police protection at mosques and other houses of worship following the Joplin fire and a deadly attack at a Sikh temple in Wisconsin. The Council on American-Islamic Relations also offered a $10,000 reward for information leading to the arrest and conviction of whoever started the mosque fire. About 50 families belong to the Islamic Society of Joplin, which opened in 2007 as a mosque and community center. The FBI led an investigation in 2008 when the mosque's sign was torched. That crime also remained unsolved. Lahmuddin, who has lived in Joplin for about four years, said several people were at the center late Sunday. He said despite the attacks, the center's members have good relationships with residents and other churches. He said many are doctors at area hospitals. On Sunday, a gunman killed six people at a Sikh temple in suburban Milwaukee. The imam said it was a cause of great concern that both faiths had seemingly come under attack. "I heard that yesterday, and this morning we see this happen in our place," he said. "We are more fortunate that no one here got hurt in this incident."